The name carnelian comes from the latin word, carne, which means flesh. 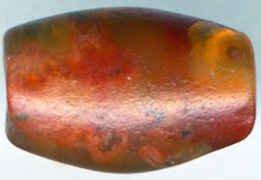 The bead above clealy demonstrates why carne was chosen by the ancient Romans to describe the color of this wonderful semi precious stone. 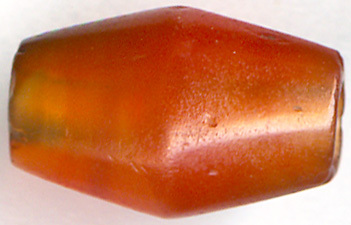 Carnelian can be seen in all graduations from translucent to non translucent. 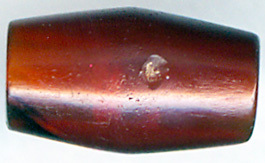 The shine can be from waxy, creamy to vitreous. 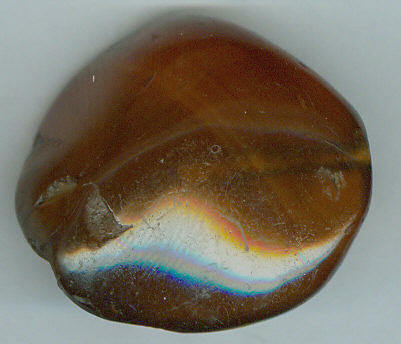 The colors can be from yellow to orange to dark reddish brown. 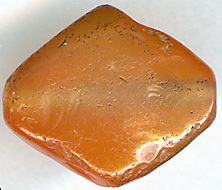 Carnelian is basically a form of chalcedony with a blend of iron oxides which is giving the rusty color to the stone. 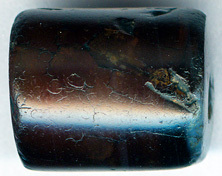 The iron oxides can be distributed uniformly as you can observe in these Indus Valley beads or in graduations as you can observe in the bead above. 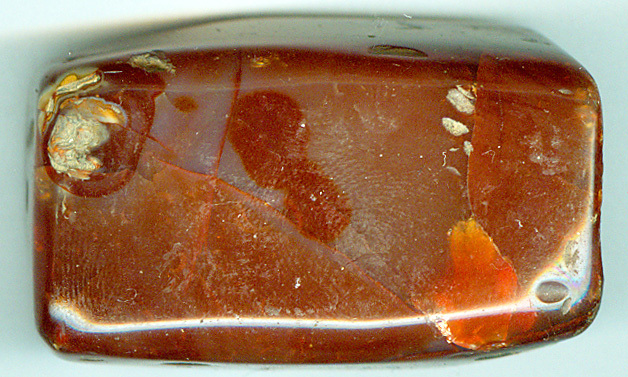 The iron oxide patterns can even be seen as cloudy patches or as reddish dots also called blod spots by the Tibetans. 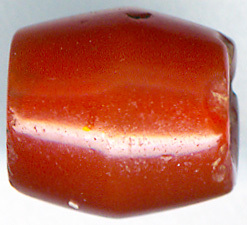 There are huge differences in the quality of carnelian. 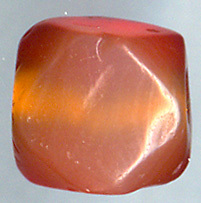 Ideally carnelian, whether used for beads or other forms of art, should be without banding and with uniform deep translucent red-orange color. 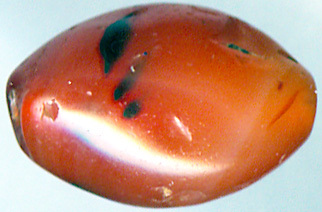 This was and is rare to find in natural form and even not easy to make additional treatment of the stone. 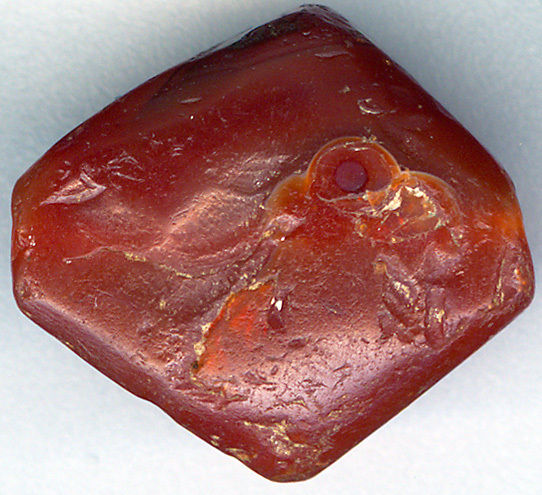 No wonder that this kind of carnelian was very sought after in ancient times. 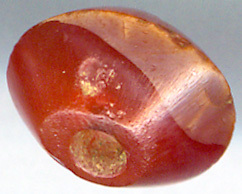 The best carnelian should be as translucent, as red and as homogenous as possible. 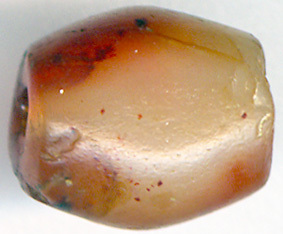 The small ancient beads displayed below are marked by time. 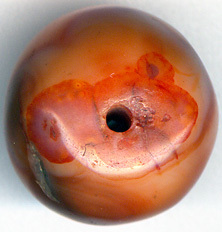 However the quality of the carnelian with its deep uniform transparent red color is still second to none. 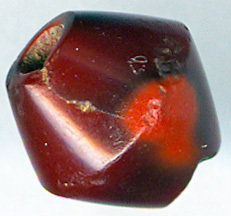 According to the Egyptian Book of Dead, red symbolized blood and therefore life and energy. 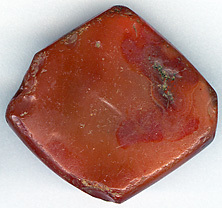 Most probably the ancient Indians had similar beliefs about carnelian. 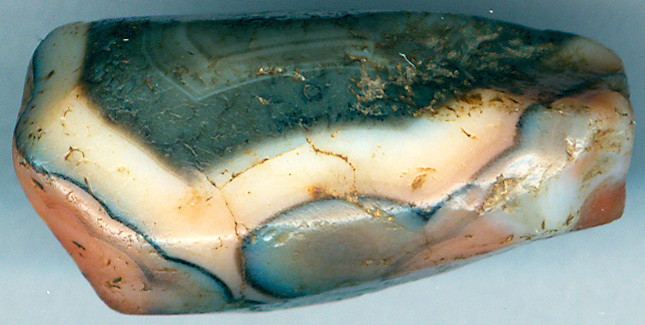 Note the color similarity in the pietre dure inlay above. 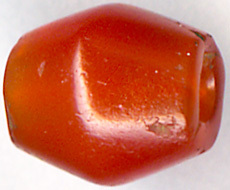 In the inlay work in Taj Mahal only the highest quality of carnelian was used. Such ideal pieces of carnelian stone are mostly found in smaller specimens. 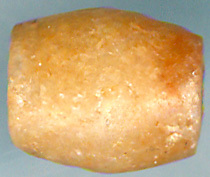 In smaller pieces a synthesis of all three ideals were more likely to achieve. 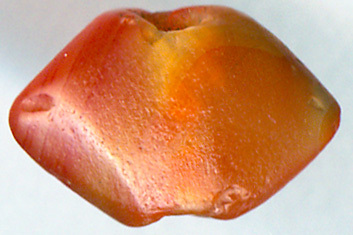 Displayed below you will find carnelian beads with a more orange yellowish, yet still also reddish color. 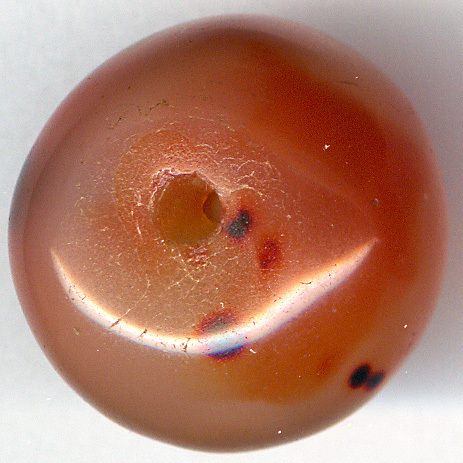 The color and translucency of these beads is perfect homogeneous. 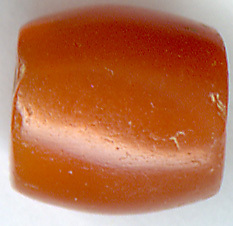 This type of carnelian is a little more common. 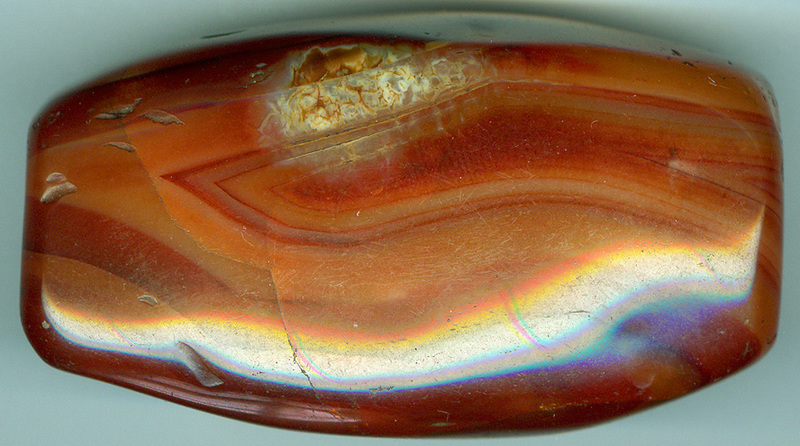 However in ancient times it was still valued as a treasure with magic qualities. 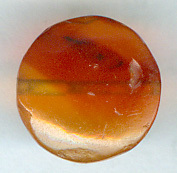 Below you can enjoy translucent dual colored red orange carnelian beads of a still high quality. Beautiful orange to red colored translucent carnelian beads. 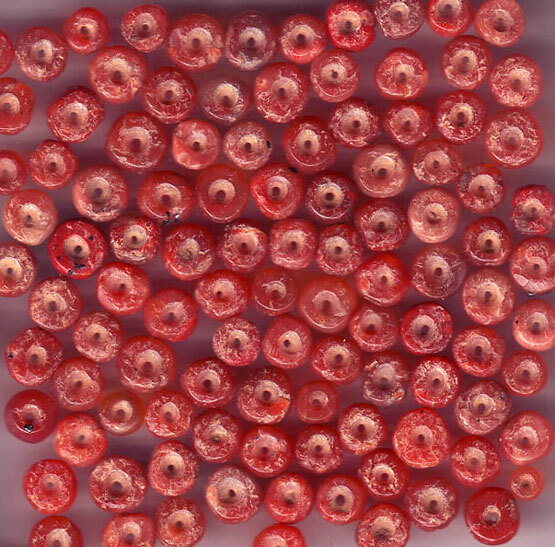 You can see the holes through the beads. 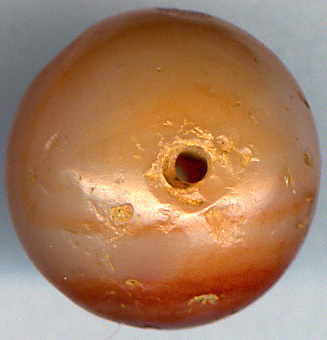 And here an old but not ancient carnelian bead with almost sun-yellow color with less translucency. 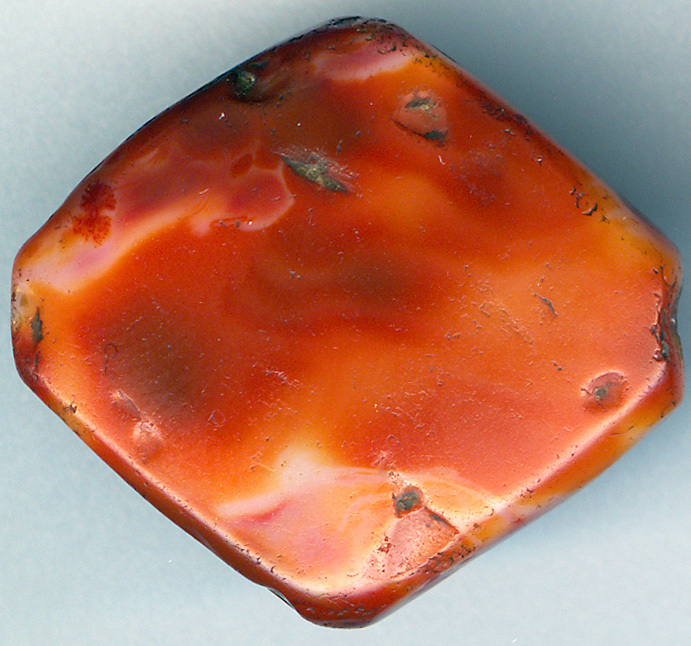 The love for carnelian goes way longer back than the days of Shah Jehan. 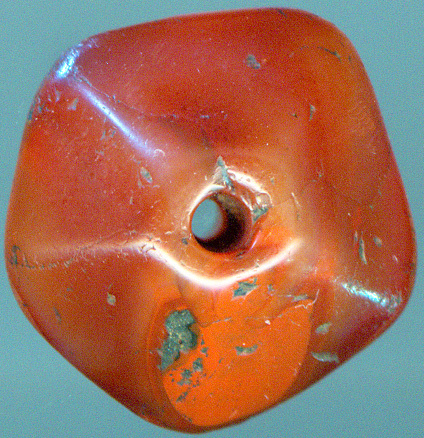 We find the use of carnelian even in the Neolithic period. Below is a photo I took in Moroccan Sahara, near Hamid. 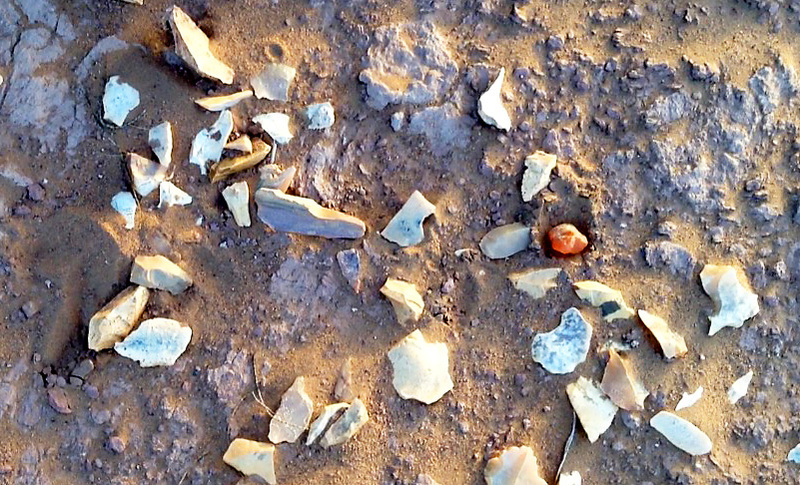 It shows Neolithic flint remnants lying on the hard crust of the dessert. Note the small carnelian stone there too. 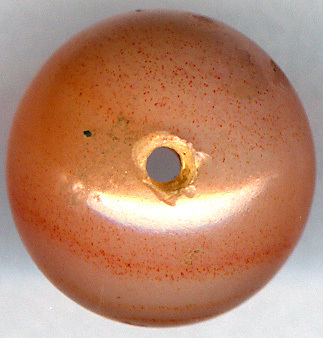 My guess is that Carnelian is, not only the favorite of Mumtaz, but the favorite bead stone of all times. 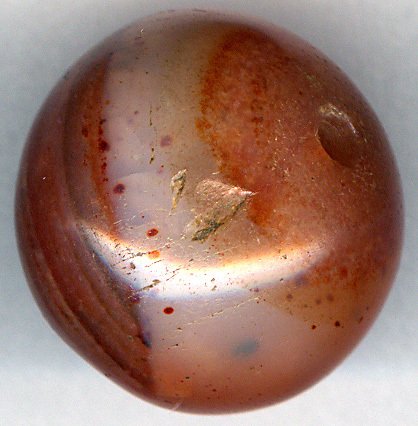 So much was the demand for this blood colored stone that it was difficult to find enough natural carnelian in its motherland, India. However we humans always find new ways to solve or bypass problems. The Indus Valley people Culture invented the art of transforming Chalcedony into carnelian to meet the demand. 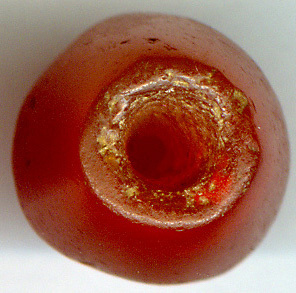 Beads are great travellers, but they all have a home, a place of origin. 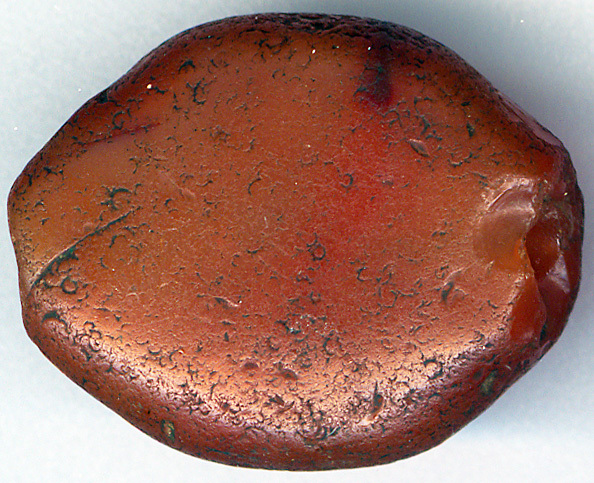 Most of the ancient carnelian beads found around on the globe have originated from India. 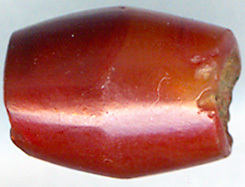 Bead making was common throughout the continent. It mostly depended on where the materials where available. 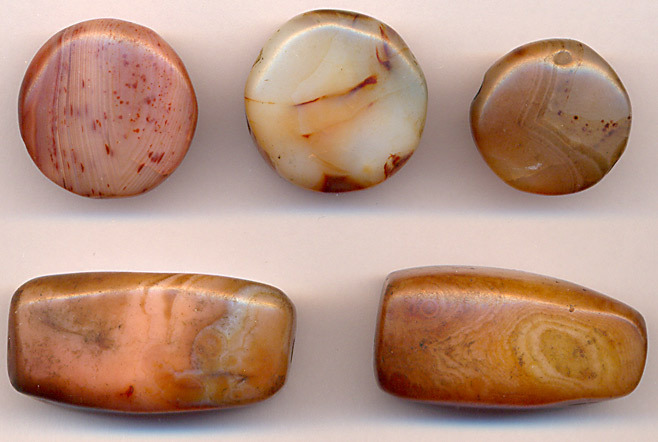 Although agate and jasper can be found in many parts of South Asia, the extent, diversity and sheer richness of sources in Gujarat is however unparalleled. That could be the reason why Gujarat, in particalar a place called Cambay still today has an alive bead making tradition where the skils of the ancient bead masters has continued up til present. Cambey or more accurate, the nearby Lothal, a Harrapan outpost, has been a stone working center since the Indus Valley people started, out of the regions rich deposits, to make beads of carnelian, onyx and agate. 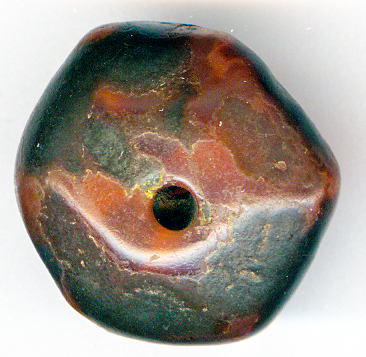 Lothal is around 4000 years old, but the Indus people began bead making and exporting more than 5500 years ago! 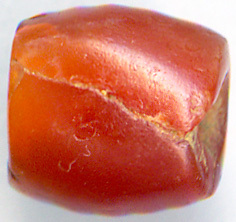 The high iron content of the carnelian from Gujarat and especially the area around Cambey accounts for its wondelful red orange colour as you can observe at its best in illustration 2, but also in the small carnelian pebbles from Lothal shown above. 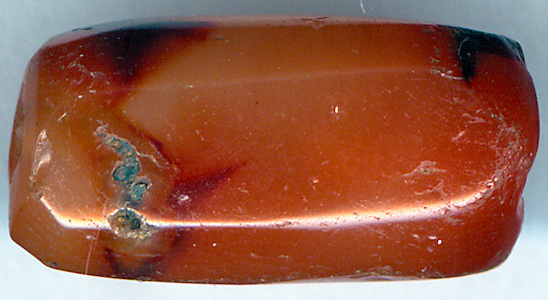 Since the Indus time people with simple tools have been digging tunnels into the Miocene high iron saturate agate formations in the Babaguru formation. 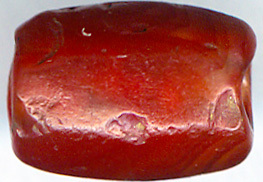 The dark red colors are amplified by drying the stones in the sun and then repeatedly heating them. 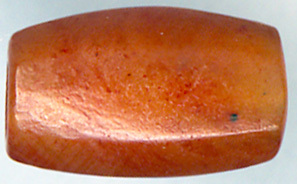 The techniques and tools used by the Indian artists have only changed a little since the days of the Indus Valley culture. 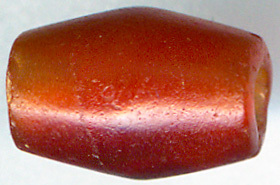 Their beads are all hand made and therefore less uniform in size and shape. 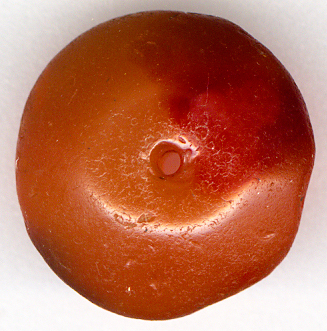 The Cambay carnelian beads have the warmth and beauty that comes from being hand crafted. 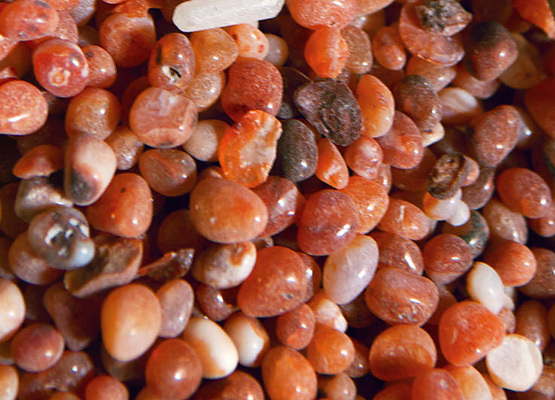 Because of their enduring appeal, Cambay is still one of the largest stone manufacturing places in the world. Africa was the major consumer of the region�s output. 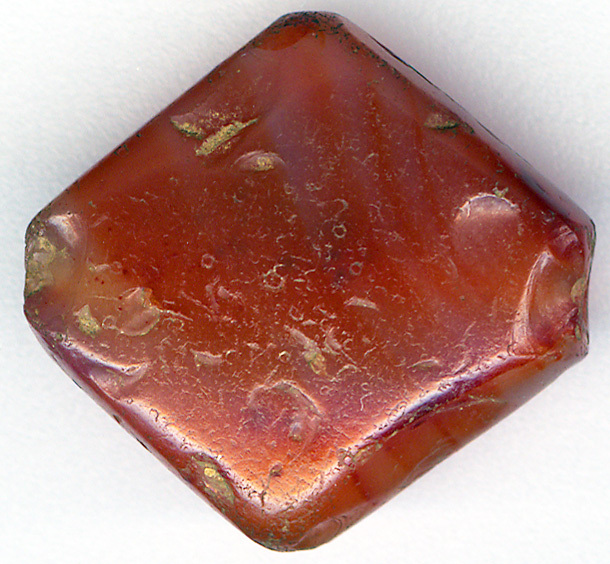 From AD 1300 the industry began to flourish in the Cambay area, as craftsmen produced Muslim amulets, prayer strands, and great quantities of carnelian beads for the African an middle eastern market. 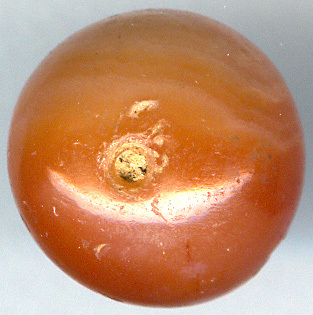 Arab traders ferried these goods to eastern Africa in monsoon-driven dhows, or carried them to Mecca and Cairo and thence into western Africa via camel caravans. In this way Moslems became to a great extent the transporters of beads, especially due to the implicit religious demand, Haji, to travel to Mecca at least once in a lifetime, no matter where on the globe you as a Moslem were settled. 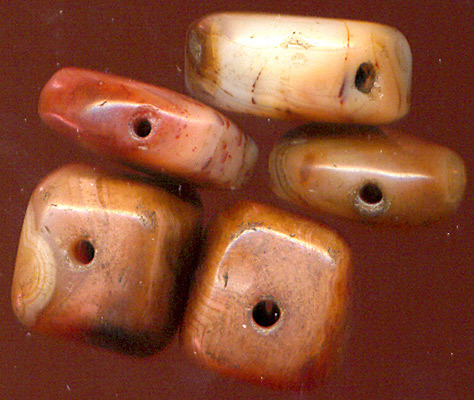 Beads were easy to carry and asy to sell in order to get provision on the long strenuous journeys. Islam was an international religious and therefore also cultural phenomen with Arab as the lingua franca. Islam was at its heigh bringing people from all races and cultures together in a great global melting pot. As long as you had converted, it did not matter what color your skin had or what language you spoke. 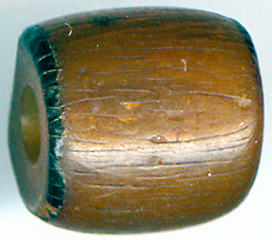 Where Islam was, beads were following and they got mixed up the same way as the people who wore them. Before Islam, Buddhism was doing the exact same thing in oposition to the more exclusive and feudal Hindu culture, where people were bound to the cast and the earth the were born in and on. 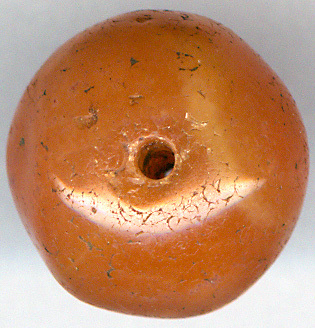 Around 1500 Cambey further expanded and became a huge bead industry, when Moslem settlers lead by the Ethiopian Saint Baba Ghor, which means Holy Bead-Man, started to mass produce beads in an up till then unknown scale. 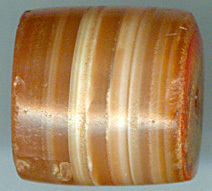 This bead production was unchallenged for hundreds of years. 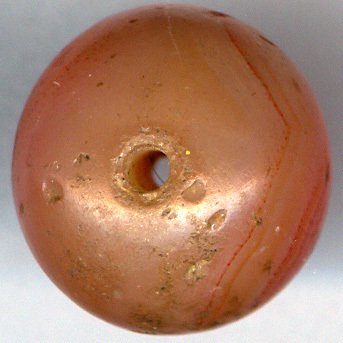 However 19th century brought competition, first of all from carnelian beads and ornaments carved in the city, Idar-Oberstein, in Germany. 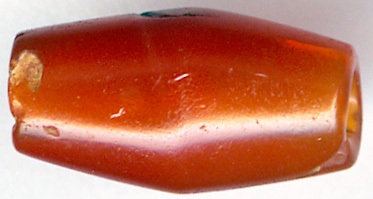 Shortly after molded glass imitations made in Bohemia were flooding Africa. 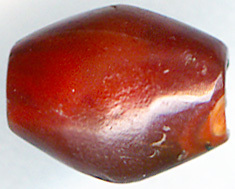 The Indian bead industry could not deliver beads in the Idar Oberstein quality and hence the Cambay bead trade declined to a great extent. 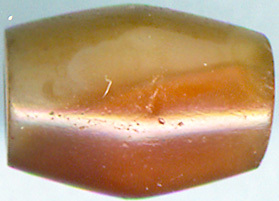 The huge non transparent bead below was sourced in Punjab, India. 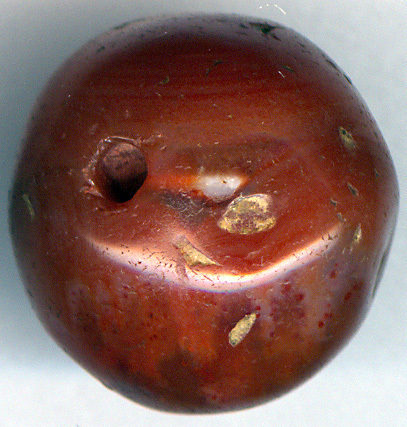 As one can observe in the sharp edges of the hole, this super large and heavy carnelian bead has never been used or at least not much. It looks new. However the discoloring made by calcium in the earth reveals that this bead actually is ancient. 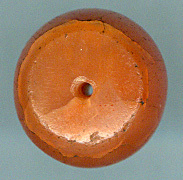 I have found exactly similar beads Africa. 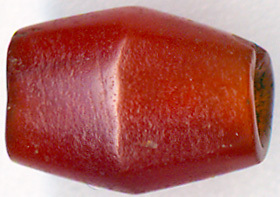 In the section with African Fulani Beads you can observe these beads. 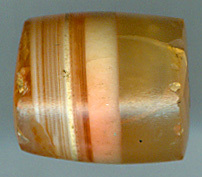 This bead does have banding. So one could also call it a red agate bead. 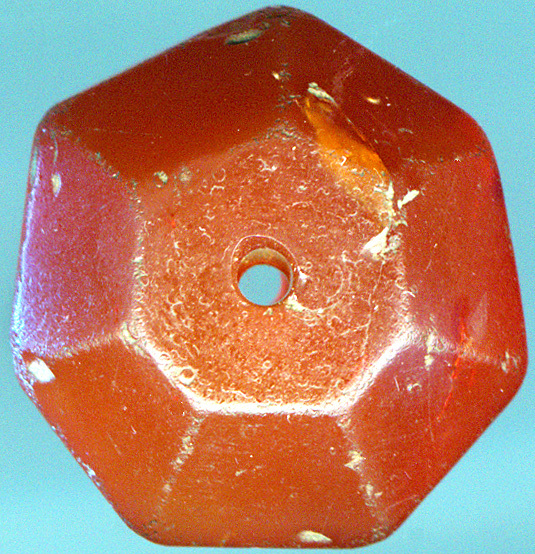 However this is a distinction without a much difference, as both are red-orange cryptocrystaline quartz. 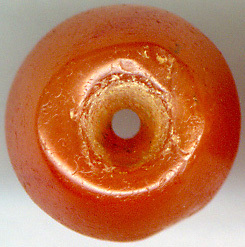 This bead is an example of the huge bead trade from India to Africa going on since ancient times. 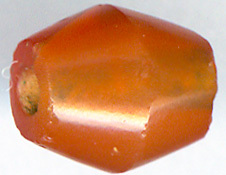 The bead displayed below is a heptagon shaped carnelian Bead. It is almost radiating age like a face full of wrinkles! 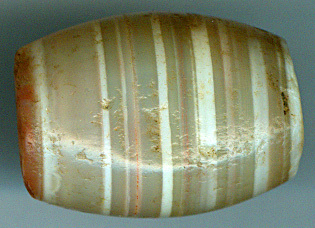 The bead is etched by thousands of years sleep. 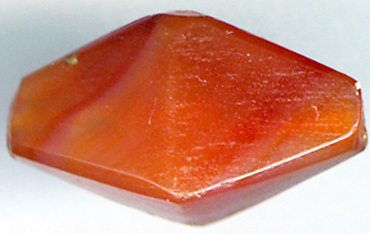 A closer examination discloses the highest quality of carnelian. 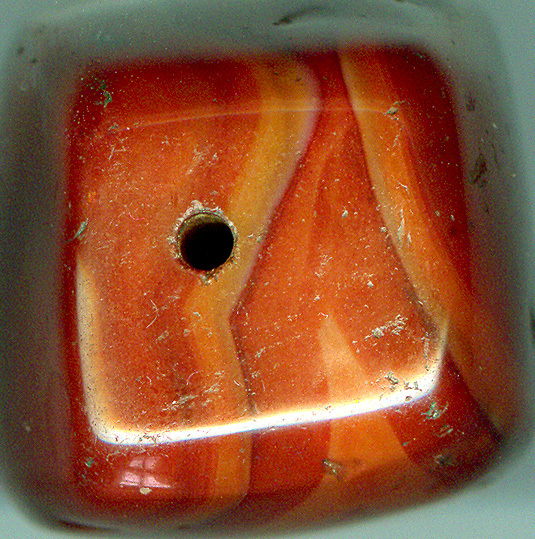 The calcium layer on the bead is the thickest layer I have ever seen on a bead. 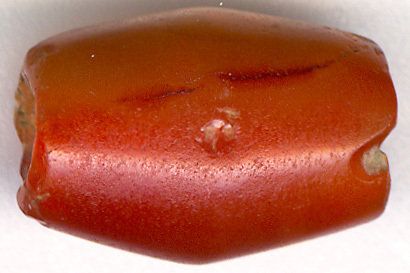 This thickness of the layer could be due to special concentrated chemicals in the ground it was sleeping in, but the hexagonal beads here are the most surface changed beads in my collection when taking both chemical layers and polish by wear in consideration. 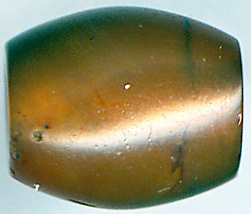 It indicates above all the awesome age of these specimens. RB 4 displayed above was found by a Danish archeology professor during his excavations. It was placed among far more primitive shaped stone beads in a Neolithic grave in Moroccan Sahara. 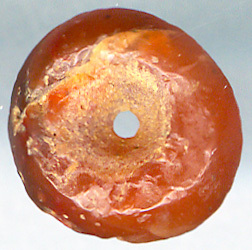 This bead must be around 5000 years old, because the many settlements are from the Saharan wet period. They are dating from 8000 BC. 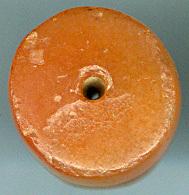 up to 3000 BC. From then onwards Sahara transformed into a dessert and the many hunter gatherers left the area. 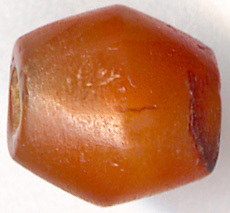 After this find I went to Morocco and found a few similar beads in Marrakech. I was extremely lucky to purchase some on the internet too. 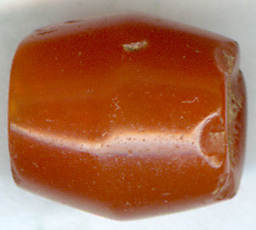 According to the bead expert Malik Hakila, the facetted carnelian beads above and below display the typical carnelian orange-red shine that in ancient times only carnelian from the area around Cambey in India had. 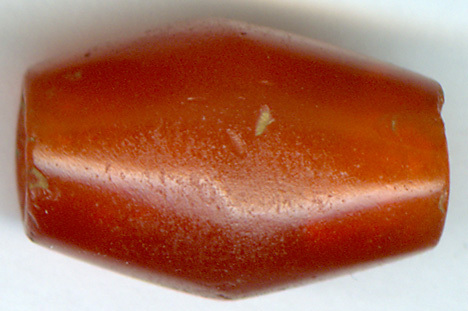 However we don't find facetted carnelians beads in the Indus Civilization. 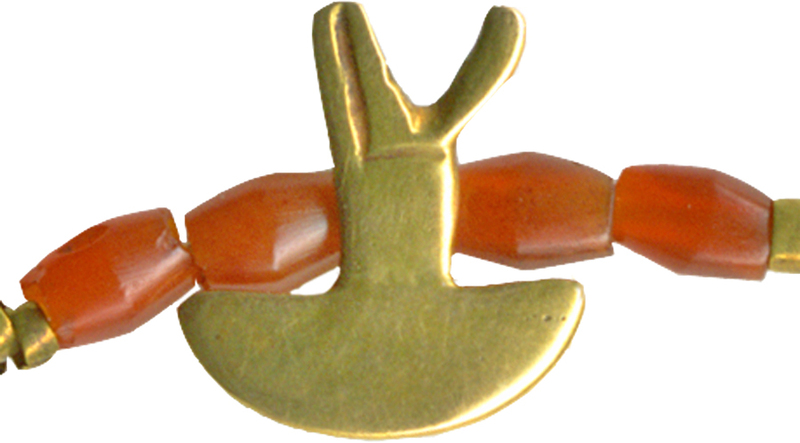 As we can observe through bead history every geographical area in every historical time had its own favorite beads with certain patterns, shape, material and color. 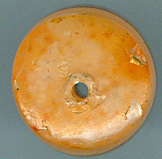 The Indus people did not seem to like facetted beads, but the Mesopotamians did. 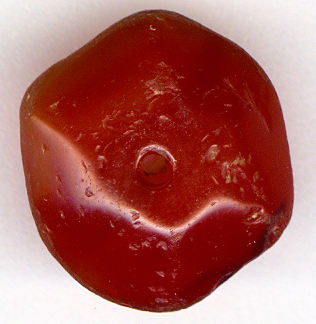 Accordingly my best guess is that this wonderful polygon highest quality carnelian disk bead and the ones you see below, were made by Indus people for the purpose of export to the Mesopotamian Proto Elamite elite in the the early Bronze Age. According to science the trade between the advanced urban civilizations of Mesopotamia and the Indus began around 2600 BC. 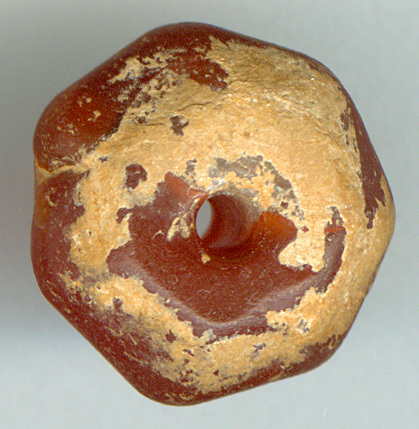 For this facetted Indus carnelian bead to end up in a Neolithic grave in Moroccan Sahara we must at least extend this relation back to 3000 BC and maybe even further! 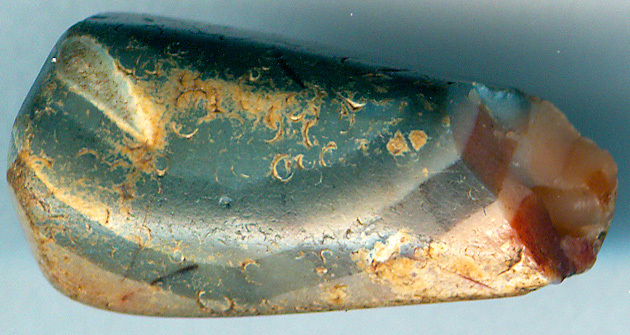 Some historians relate the earliest Proto Elamite script with the Indian Dravidian language which points at the existence of a Elamo-Dravidian culture stretching all the way from the Gulf to India. 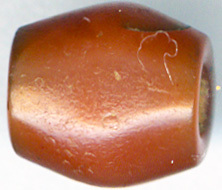 Seen in the light of the Elamo-Dravidian connection bead making and exporting relations between the two areas might very well open up for the possibility of an Indus bead ending up in a Saharan Neolithic grave. 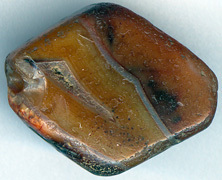 The Proto Elamites had trading relations with Neolithic cultures as far as North West Africa. 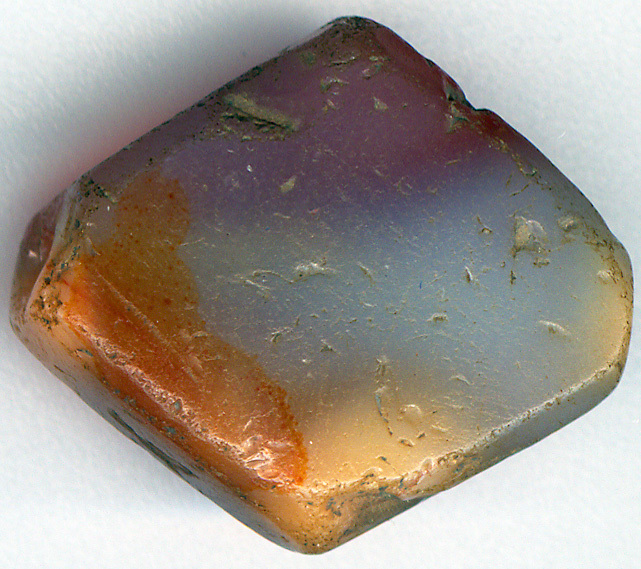 For the Neolithic people in west Sahara the Proto Elamites were the closest 'higher' trading civilization at the time of the decline of water in the area. 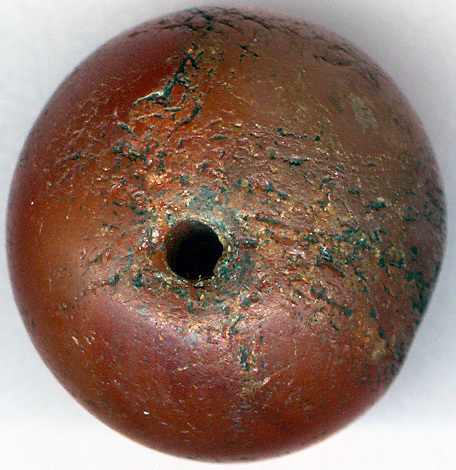 So this super ancient bead most probably ended up here due to the exchange of goods with contemporary, but more far more advanced cultures further east. Remnants from several Neolithic settlements can be found in Moroccan Sahara. 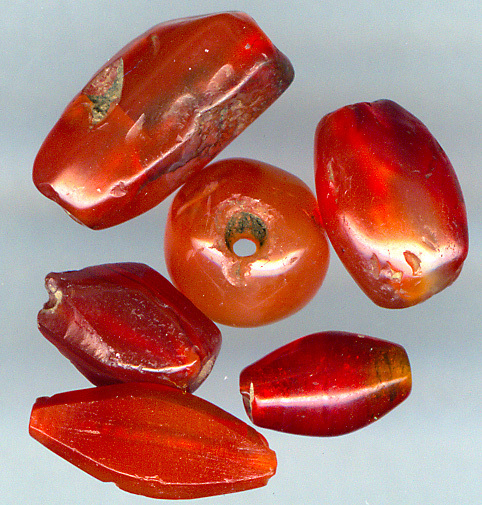 For sure these Neolithic cultures did not have the technology to fabricate polished polygonal shaped beads. 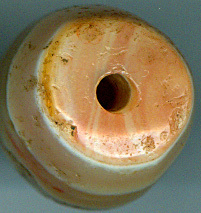 As you can see here, Neolithic beads from West Sahara have a far more 'primitive' design equivalent to their technological level in general. 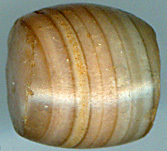 Beads are indeed great travelers and their journey is often proportional with their age. 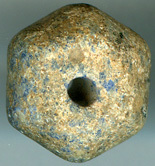 The beautiful and large heptagon bead displayed below was a part of an ornament from the Kings of Benin, Nigeria 1000 to 1300 A.D. It might have been ancient way before it reached the African mainland. 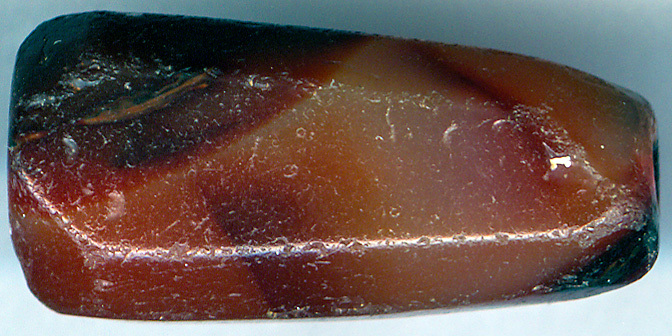 Note the extreme high quality in the carnelian itself. 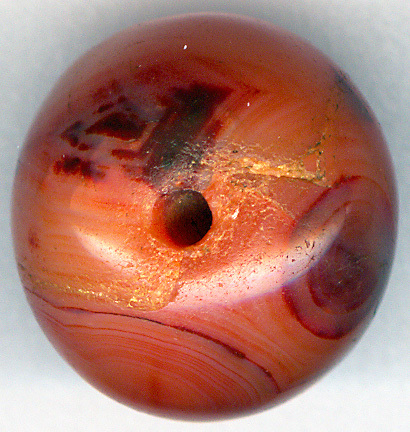 It is rare to find such a large bead with this ideal deep orange red translucent and perfect uniform Cambey color. 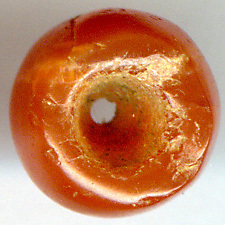 It does not look so old as the other beads, and this bead shape was produced for thousand of years after the Indus period. 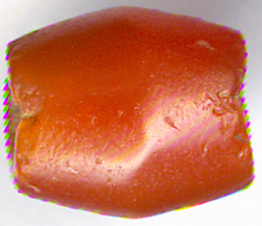 However the carnelian itself points to the same period as its more torn and worn brothers. I have to leave this beads age to the unknown. 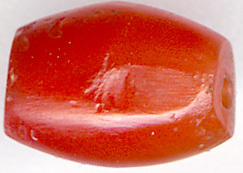 In the Danish national museum in Copenhagen there should be an exact similar bead to the one displayed above, woven into the dress of a chieftain from Papa New Guinea! 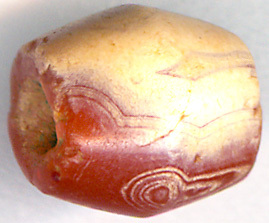 This particular bead has never been in the possession of western hands. Most probably it went eastwards from India via Chinese sea trading routes to Papa New Guinea. 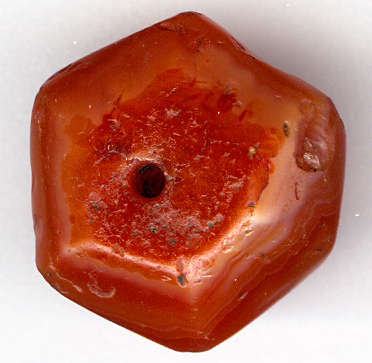 Displayed below is a super ancient Pentagon shaped carnelian bead sourced from the Harappan Indus culture in Pakistan. 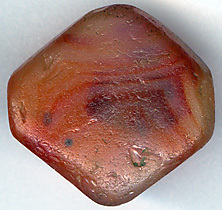 As mentioned it is very rare to find this type of bead in the Indus area. I just love the way the bead displayed above has been shaped soft through the contact with countless generations of human skin. 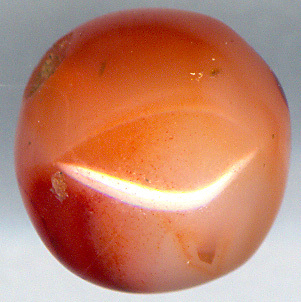 Again we find the highest quality of carnelian. 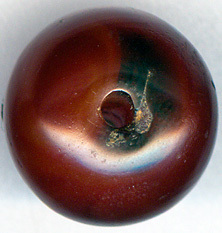 The discoloring in the button of the bead is made by earth and time. 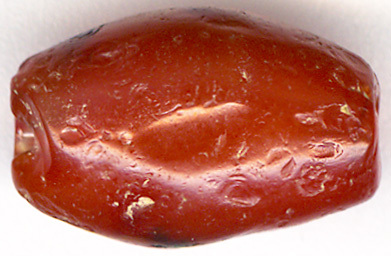 I personally find that the talismanic power of beads, that have been more polished by the contact with human skin, than by the actual polish in the making of the bead, is awesome. 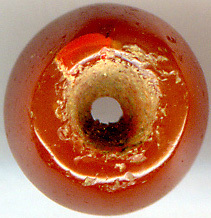 Why love mega ancient beads? Because they have wrinkles like a face of an old wise man. Because they are imperfect. Perfection has no spirit life. Young people are seldom spiritual. Spirit grows with age in both beads and humans. 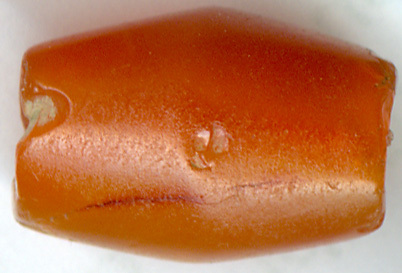 These worn out beads are perfectly imperfect. 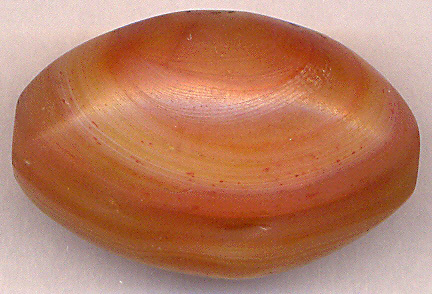 Time has signed them like soft round stones on the beach. 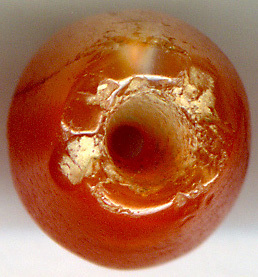 I do not have any beads in my collection that has been so much polished by wearing. 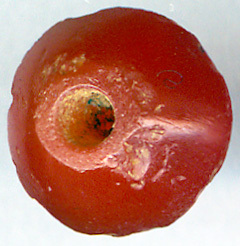 These beads are super ancient. 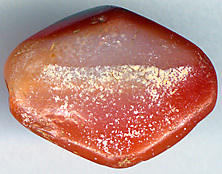 Carnelian has a hardness on the Mohr scale between 6,5 to 7. 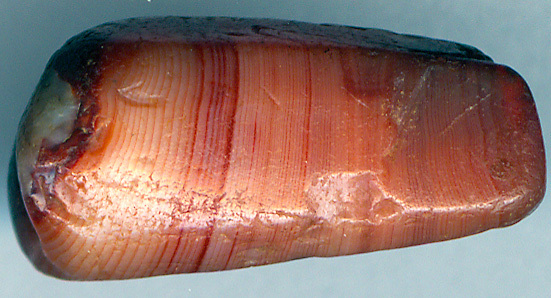 Imagine how much time in contact with human skin it need to make beads like the ones you see here! 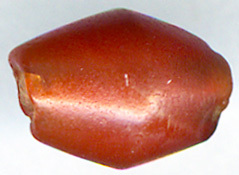 Most of these beads were sourced from Moroccan Sahara. It shows, what cannot surprise: that the earliest higher civilizations had trading contact with the hunter gatherer civilizations which surrounded them. 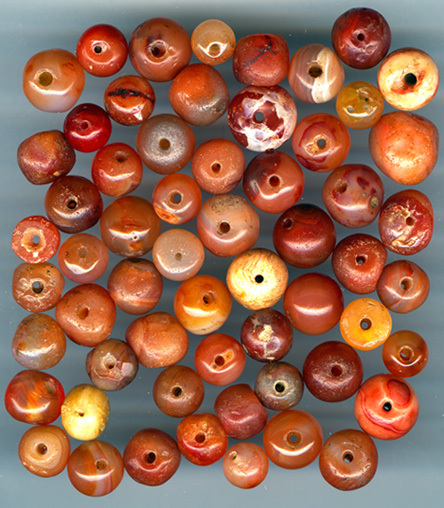 As you can observe on the page Neolithic beads, most of the beds displayed here are more crude made. 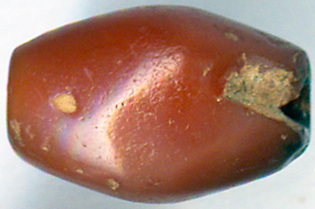 Only more 'advanced' societies could make beads as the fine polished and facetted beads displayed above. 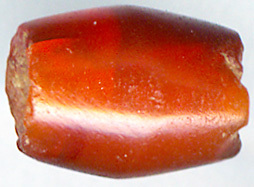 Almost all of them exhibit the highest quality of carnelian. 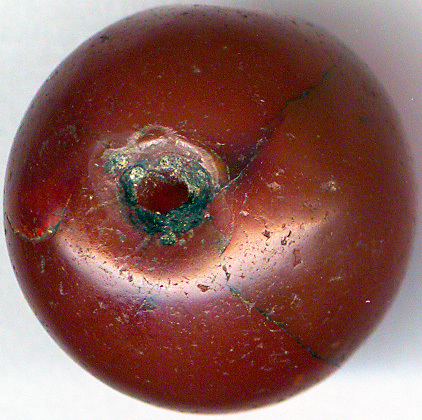 If you look at the beads super ancient Indus beads below, you will see that they all still have marks of pecking even though they have been after polished on a grinding stone. 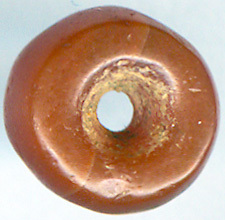 This is typical for beads from the Neolithic period. Also note the high quality of uniform deep red carnelian. 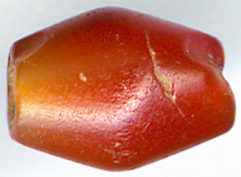 shows the same carnelian type of bead to the right. 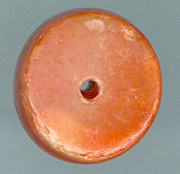 These rare beads below are with their special design and large, well made holes typical for the Harappan Civilization. 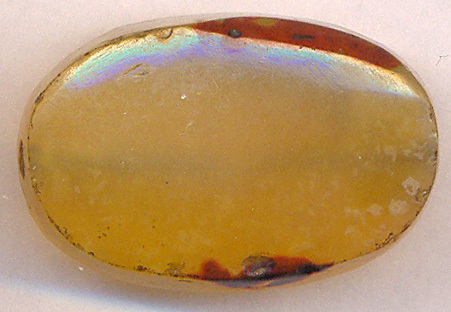 You can see them displayed in the National Museum in New Delhi. 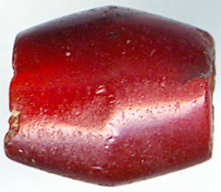 On the picture above you can observe how the same type of beads were used in Egyptian jewels. 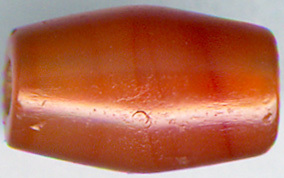 The beads displayed below are small. 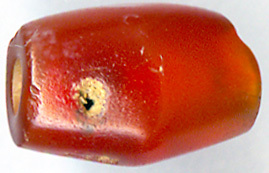 Note the wonderful homogeneous translucent and red color in most cases only found in smaller specimens. Beads like the ones displayed above were produced for export by the Indus people from more than 5000 years ago. 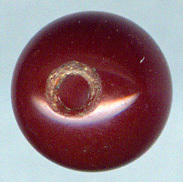 You can compare the Indus beads OIV 9 and 10 above with the beads below to see the similarity in design. 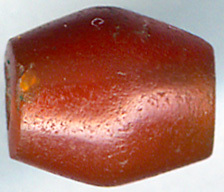 Several of the beads displayed below are most likely to be 'only' around 500 years old. They are from the heydays of Baba Ghor, whom I mentioned in the beginning. 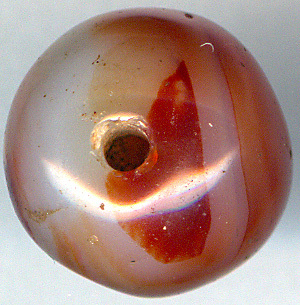 The Baba Ghor beads are, what is easy to observe made out of carnelian stones of a far lesser quality than the much older Indus beads above. 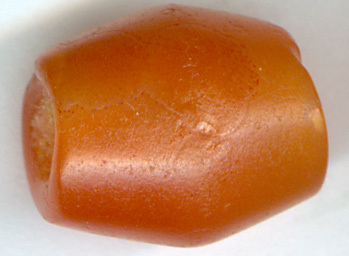 Baba Ghors export beads are not rare and not as old as the above high quality Indus carnelian beads. The holes are smaller. The craftmanship is primitive, but powerful like an African tribal mask. These beads are still very easy to get, but for how long? Is the baba Ghor story a myth? 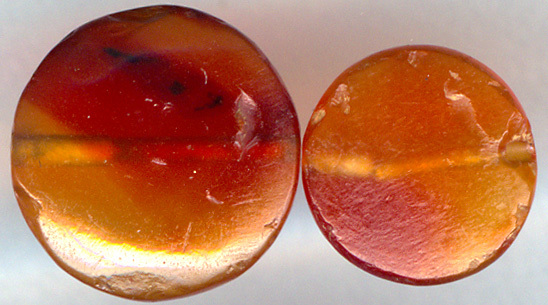 However when I look at these beads, they do not seem to be 'only' 500 years old. They look ancient to me. 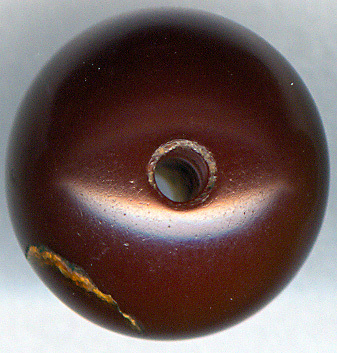 I recently talked to an Indian bead expert, who told me that according to his view, the Baba Ghor story was a myth. He told me that there since ancient times had been huge amount of ancient beads scattered around n the area. 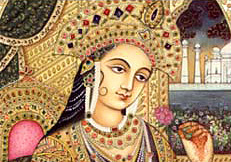 As an example he mentioned an area in Gujarat called Ghansor, or Naga Baba Ghansor. In this area, like many other similar people had for generations collected beads from Indus sites and sold to especially the Moslem faqirs. 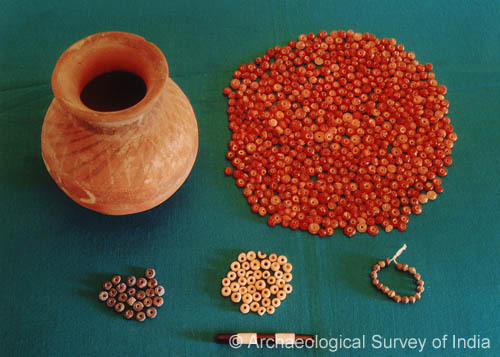 Beads like the ones below were then not produced 500 years back, but collected from sites since the last 500 years. I tend to believe this explanation more than the official Baba Ghor myth. 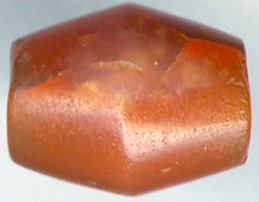 Note the high quality of the carnelian. How to tell the difference? 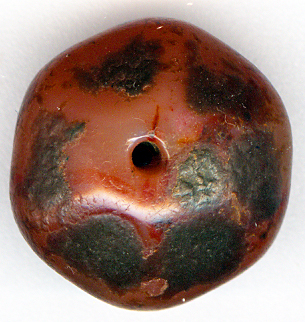 Often wear and tear is the only indicator of age, because the designs of these beads are super ancient. They can be traced back to Indus Culture. 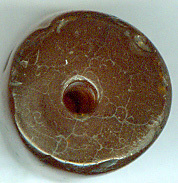 A comparison between the bead designs below with the bead shown in this Harappan link will further substantiate this claim. 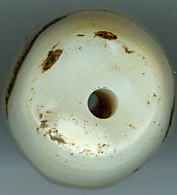 It is unlikely that Baba Ghor and his followers invented any new bead designs. Most probably they did as Muslim conquerors were best at all the new territories they came to: sampling information and skills from the already existing cultures. 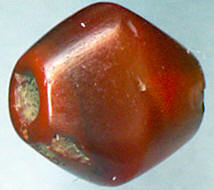 The production in Idar Obersten again copied the Ghor beads to be sure of a steady demand from Africa. In this way the Germans made copies of Indus valley beads. 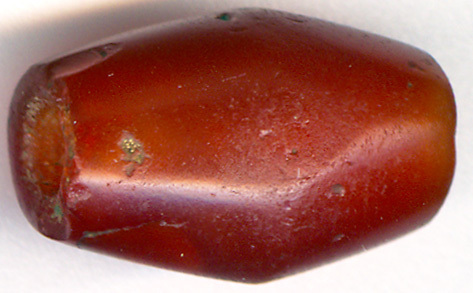 How much wear and tear will carnelian beads have after 500 years? 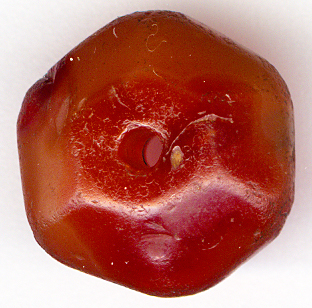 My guess is that the beads above are older than the Cambey Ghor period. 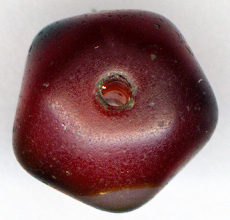 The 6 beads below are in my opinion more in sync with not thousands, but hundreds of years of human time ravage. 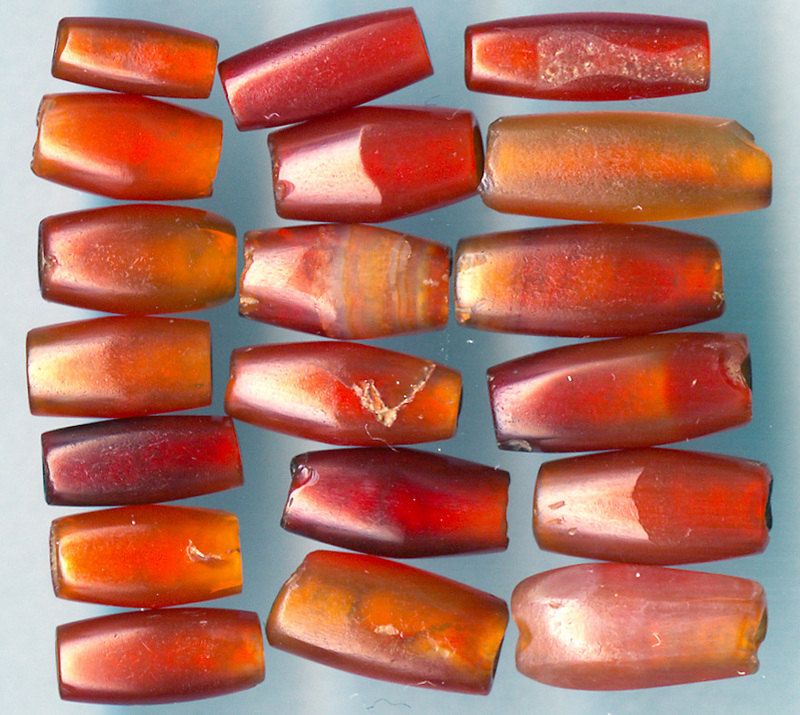 The amber like glow of these translucent elongated ancient carnelian beads is out of this world! 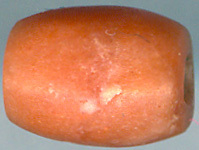 An Indian bead collector and personal friend of mine is convinced that these beads originate from India. 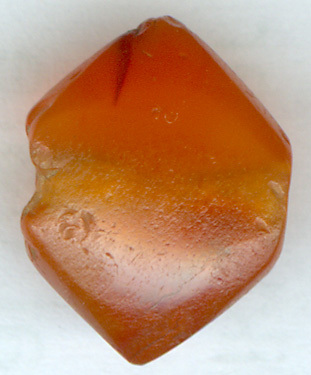 However I have only seen this amber like translucent shining carnelian in Burma itself. 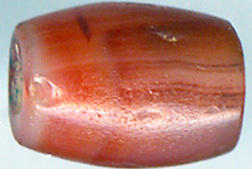 Unfortunately the scan is not able of show the true sheen of these remarkable beads. 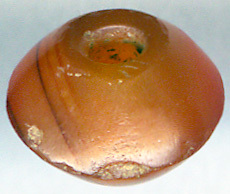 With the subtle banding displayed on these beads one could argue that they are not carnelian beads, but red brownish agate beads. 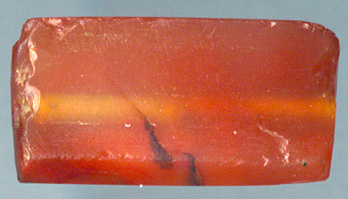 Period: Most probaby 1000 A.D.
Carnelian can be both translucent and non-translucent. 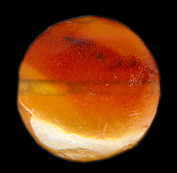 Sardonyx is carnelian or red-brown colored chalcedony with regular banding as you can observe in the beads below. 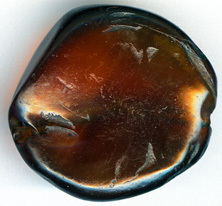 Most onyx, either black or reddish brown is like carnelian created by heat treatment. 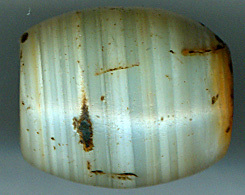 Uncooked grey banded agate. 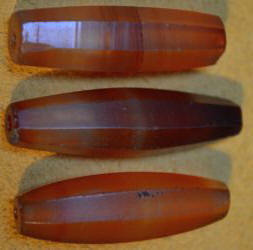 How the sardonyx beads are made you can see here. 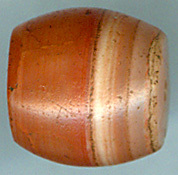 This is an extremely beautiful translucent bead from Western Asia. 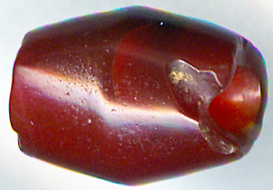 The shape and color could resemble an Idar Oberstein bead. 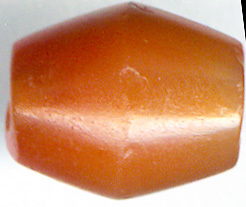 Sard is like carnelian a variety of chalcedony. 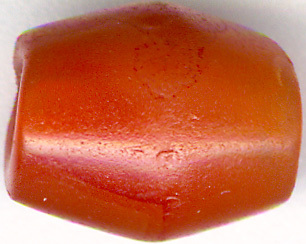 It is however harder with 7 on the Mohr scale, whereas carnelian centers around 6,5. 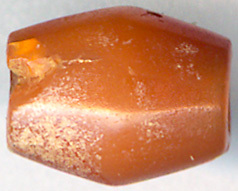 Sard is as you can see below brownish yellow in color. 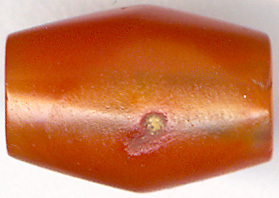 Translucent sard bead from India. 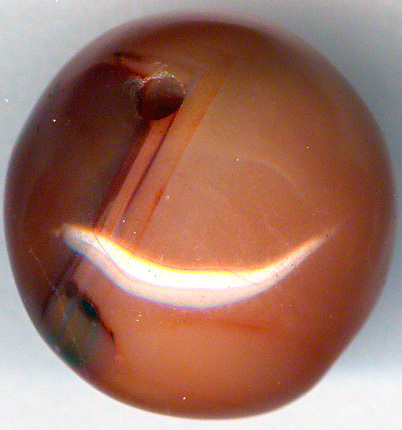 The shine in this bead is very special. Unfortunately the photo is not able to reflect it.